Steel Viking Overview | Fidelis Partners, Inc. Does your company struggle with its manufacturing software, find ways to do business in spite of or around it, or have limited and untimely data to drive business decisions? Do you seek to automate your plant floor but are hamstrung by your current ERP system? 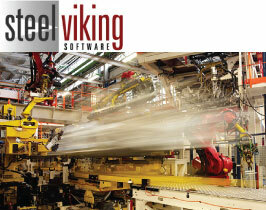 If you are evaluating manufacturing software and have not found the right solution, we invite you to consider a unique alternative, Steel Viking Enterprise Software from Fidelis. Fidelis developed the software and will implement it while working closely with your organization, including customizations, data conversion, and training. Our implementation track record of 100% success and growing list of clients is evidence of the value of this unique approach. A key to implementation success is the Software Discovery, where we work on site with your team to merge current and future business processes with software design to formulate a detailed implementation blueprint and quote.